The Balkans in the last few days is showing further signs of a growing Salafi Islamist menace and the usual traits of Albanian nationalism. Ironically, the “old battleground in Kosovo,” whereby the Orthodox Christian Jerusalem was taken away from Serbia, is now showing a hidden danger to both Muslim Albanian dominated Kosovo and Republika Srpska in Bosnia. Therefore, terrorist sweeps took place in Albanian ruled Kosovo and the Republika Srpska. In Macedonia the current crisis is hitting the headlines because of the numbers of people killed in clashes between the security forces of this nation and ethnic Albanians. Indeed, the government of this nation is at pains to keep information rather secretive because of fears of stoking the fire. However, it does appear that the terrorist attack in Macedonia was based on Albanian nationalism. Macedonia should worry the most because in Bosnia, Cyprus, and Kosovo, the West sided with the Muslim side on each occasion against Orthodox Christians. On top of this, just like in the current crisis in Syria, it was clear that in Bosnia the governments of America and Turkey – and others – understood the need to utilize international jihadists. This is because these two nations, and others, enabled the international Islamist menace to military arm itself in order to butcher Orthodox Christian Serbs in Bosnia. Not surprisingly, revenge attacks against internal Bosnian Islamist forces and international jihadists was met by brute force (this reality took place alongside ethnic nationalism). Also, beheading people became an Islamist calling card just like Takfiri forces in Iraq and Syria are beheading Alawite Muslims (Syria), Shia Muslims (Iraq and Syria) and loyal Sunni Muslims in both nations. Ivo Kotevski, the Interior Ministry spokesperson of Macedonia, confirmed that eight Macedonian officers were killed alongside 14 individuals linked to the Albanian nationalist terrorist group. The scope of the attack is further made clear because 37 Macedonian officers were injured. Therefore, the attack was well planned and aimed at destabilizing Macedonia. 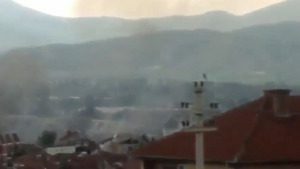 Currently, the government of Macedonia is indicating that the security crisis in Kumanovo is under control. Yet, while this is highly desired, it is still too early to form any clear conclusion. 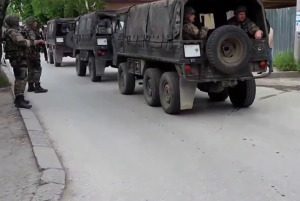 After all, it is not known how high the chain goes and if the attack on Kumanovo is based on higher objectives? Meanwhile, in Muslim Albanian controlled Kosovo security forces arrested many Islamist Albanian Takfiris. The Special Court acknowledged that 32 individuals were arrested based on having direct or indirect links to ISIS (IS – Islamic State) and al-Nusra in Syria. The seriousness of the Takfiri Islamists threat towards Albanian Muslim dominated Kosovo was made abundantly clear by elites in Pristina last year. This was based on a statement released by Pristina whereby militant Islamists were deemed a “threat to national security.” In this ironic sense, militant Islamist forces utilizing Syria based on Gulf petrodollars – and the intrigues of nations like America, France, Qatar, Saudi Arabia and Turkey – are now a threat to indigenous Islam in Albanian and the Orthodox Christians of Kosovo (this embattled Christian community is also threatened by Albanian nationalism) and Bosnia. Once more, the arrests by the Bosnian Serb entity of suspected Takfiri Islamists is also linked to the destabilization policies of outside nations aimed towards the secular government of Syria. Clearly, the Takfiri Islamist menace towards secular Syria based on the intrigues of the usual players is creating terrorist and sectarian alarm bells throughout parts of the Balkans. Recently a Takfiri Islamist killed a police officer in Zvornik on April 27, 2015. This reality, and security sweeps in Republika Srpska and in Albanian Muslim dominated Kosovo, is highlighting the terrorist and sectarian ripples emanating from Syria because of the intrigues of outside nations. Sadly, this reality is based on the intrigues of international jihadist networks, several NATO powers and major Gulf nations like Saudi Arabia and Qatar. Obviously, for the people of Bosnia – irrespective if Catholic, Muslim or Orthodox Christian – the hands of outside nations aimed at overthrowing the government of Syria also draws major parallels to nations involved in the Bosnian crisis that erupted in the 1990s. Currently in Macedonia it appears that Albanian nationalism is the main component but Takfiri Islamist forces will be waiting for vacuums to emerge. Therefore, the recent violence in Macedonia needs to be dealt with immediately before sinister forces enter the equation to a much higher degree. Also, the Takfiri terrorist ratlines entering Syria based on the intrigues of Turkey must be eradicated and the same applies to keeping Gulf petrodollars out of the Balkans when based on religious militancy.